Both cars are limited to 250km/h so top speed comparisons are rather moot but one thing is for certain, the xDrive50i cost almost another 90 grand more. Food for thought. 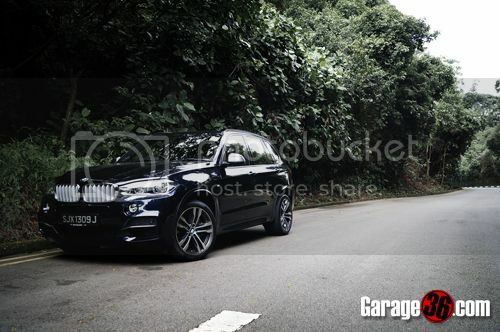 Aesthetically, the "M Performance" bits on our test car makes it a far better and sportier looking SUV (or SAV in BMW speak) than it's brethren. Although the basic shape remains, it's enhancements have nipped and tucked it into a more toned body shod with massive 20-inch shoes and equally generous tail pipes. As expected, space inside is vast and with the massive sunroof, gives a very generous feeling of space. Swathes of dark leather wrapping around the very comfortable and supportive seats and door trims give the interior a rather muted and understated atmosphere broken up with strips of aluminum highlights. Seating for 5 remains comfortable and although the rear packs 2 extra seats that can be raised from the boot floor, space way out back is best reserved for either short journeys, children, or friends who are into yoga. There are some details which set this interior apart from "normal" X5s though, the lovely to hold M steering wheel, the gearknob, those door sills, and the digital speedometer readouts all trumpet the most powerful alphabet in the World. Stomp on the loud pedal and if by any chance you're not overcome by all 740Nm of torque, you will be treated to a rather interesting soundtrack. Yes everyone, like most modern BMWs, the M50d comes with a digital soundtrack. Though in this instance, i'm not going to fault BMW. Diesels as we all know, suffer from a rather, how shall we say, a set of rather uninspiring vocal chords. Those pipes exiting the rear bumpers might be big enough to stuff melons in but most of the car's sound comes from the engine up front. It might churn out enough power to dig roads up, but aurally, remains rather agricultural. Which is why, it's best to keep the windows up and indulge in some "Active Sound Design". Or you can sink the track and pump the track with it's stonking sound system. There are again, multiple driving modes to choose from and depending on your mood, can go from comfortable, to slightly less comfortable. Some might have pointed out that Sport mode stiffens up the steering too much but personally i found it to provide the best level of resistance and feel with the sharpened throttle response that's befitting of the car's badge. Although the M50d stays planted through most road conditions, when it encounters a series of switchbacks, no amount of computers can hide how much it weighs. You don't quite flow through the bends but rather, pulverize them into submission. The trick is to go hard on the brakes going into turns and use the X50d's juicy torque and traction for the exits. It might sound strange but i honestly mean it as a compliment when i say, it drives like a petrol. Such is the engine's willingness to move up the rev range even though it redlines just below 5500rpm. Over-steer antics on this car are still probably best left to professionals. So how does the M50d stack up next to it's brethren in the X5 stable? Rather well i reckon. With enough firepower to claw at the heels of it's V8 brother and priced similarly to the xDrive35i (but better looking), the M50d now not only has the specs to prove why it's a viable alternative to it's petrol drinking brothers, but the figures as well. Next to the xDrive35i and xDrive50i, the M50d actually looks like pretty good value. Blows your mind drastically, fantastically. It has to be, automatically. Pity it's a little disappointing phonetically.